Re: Well ... I supose I should have asked ! If I can help with info for your rod please pm me and I'll take a few pics of the relative pages and email them. Indeed it helps me, Sir. Thank you. The 1953 page identifies mine as the No 1. listed there, and confirms the guides, and that the rod is in original, unrestored condition. You've set my mind at rest. It's interesting to note that the Allcocks Wallis Wizard, long rumoured to be a Hardy FWK Wallis copy, is documented by Allcocks as existing as early as 1931. The rumour was always that Hardy had made them do so as the rod design was theirs, but if the Wallis Wizard dates to as early as 1931 Allcocks may have got there first! In fact both makers assert their rods were 'made with the assistance of' ( Hardy) or 'designed by' ( Allcocks) FWK Wallis. Can it be he's got the reel handles on the left hand side?? The other chap in the boat is I think the Royalty Water Bailiff and bit about him was published recently - his name and where it was published escape me at the moment! The boatman is Henry Joseph Preston also known as Harry, who worked as a keeper on the Royalty from 1875 until 1915. There was an article about him in Classic Angling last year. 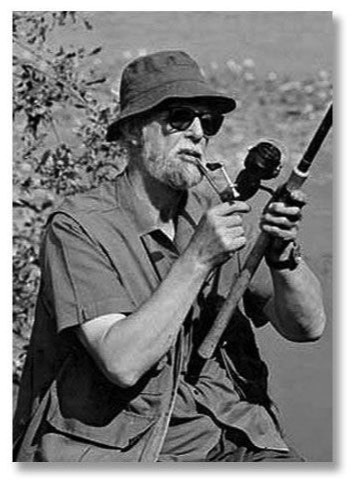 Difficult to make out but is it possibly a fly rod that Wallis is using in this picture? I don't think it's a fly rod as the reel is too far forward, so he can brake the spool with his little finger, presumably. There again, if it's as early as you suggest...pre1915,.... the picture is surely posed as cameras just weren't that good in those times and perhaps the photograph shouldn't be taken too seriously. Just what IS Jack doing in that picture? Spinning the reel so that the handle comes around and knocks the ash out of his pipe?? He must be lining up the reel and rod rings I think Nobby.. strange photo though. On a closer look I'd say you were right Nobby as there would be more handle above the reel on a fly rod.